With an adult illiteracy rate of close to 40% and inadequate infrastructure, censorship of Google searches is not an issue in Haiti. Text messages are about as much as most people have access to or have a need for. Following the earthquake, those who had a mobile phone had great need for text messaging and voice communication. In February and March I volunteered for three shifts at a multi-agency resource center in Brooklyn for those affected by the earthquake in Haiti. Supposedly the American Red Cross volunteers were there to assist people in looking for family members on the Red Cross Family Links database, but by my first shift most people knew where their relatives were. What those family and friends in Haiti didn’t know was where they could go to get food, shelter, medical care, or other help. These were not high-level discussions between corporate officers and government officials. The route to information here was simple, almost low-tech in some ways. Someone in Haiti called or sent a text message to a friend or relative in New York City. That person came to our resource center and visited various agencies to try to obtain help, or at least information. At our table, we looked up information about on-the-ground assistance in Haiti. (Yes, we used Google quite a lot.) A few days earlier another volunteer had discovered an online map of World Food Program (WFP) feeding sites. We downloaded a newer version, asked the Office of Emergency Management to print it for us (we had laptops but no printer), and someone from another agency found a photocopier to make more copies. In once particular case a young woman was trying to help her cousin’s family, who had evacuated to a rural area outside Port-au-Prince. They were equidistant between two mid-size towns. Looking at the WFP map it was clear that one town had many more agencies working there than in the other, so we advised her to have her cousin go to the first town. It wasn’t much, but we felt we’d helped direct the cousin’s family to the place where they were more likely to find help. Travel was difficult and possibly dangerous; we’d saved them wasted time and effort. Of course it’s not enough. 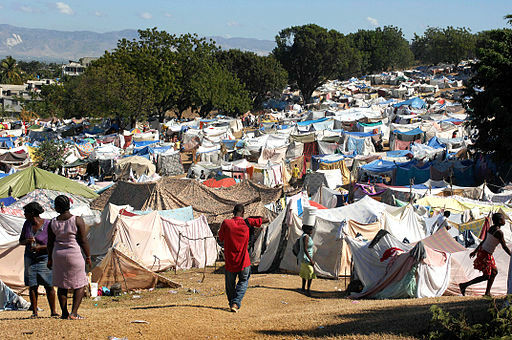 The problems in Haiti were tremendous even before the earthquake, the result of decades of poverty and poor governance, inadequate building standards, overcrowding, and years of natural disaster (most often hurricanes and tropical storms) that seem to tear down improvements as soon as they are made. Progress has been too little, too slow, too disorganized. In particular the rebuilding of homes is far behind what it needs to be. There are some legitimate reasons for this (the enormous amount of rubble to be cleared and the difficulty in determining who owns some of the land), but the pace still needs to pick up in order to meet basic human needs. One of the good things I’ve seen is that disaster relief has not had to rely on the major media; people with simple ICT tools are combining their effort to identify needs and provide aid. Another is the Haitian people’s use of simple text and voice communication to navigate the chaos of the past year. On the subject of Haiti’s recovery from the devastation of last year’s earthquake, I will leave you with the trailer to what looks like a fascinating film. Please feel free to share any thoughts or links to informative media in the comments below.